The Presto 01370 8-Quart Stainless Steel Pressure Cooker is the way to have meat (scrag ends come out both moist and tender), chicken, fish and vegetables cooked to perfection within a mere matter of minutes. Normally priced under $80 (see lowest price). The Presto 01370 allows you to cater to all sizes, from a small meal (for one or two people) to a large meal (for six to ten people), all the while cutting down the cooking time by up to 70% and still managing to save you energy. The pressure cooker is made from stainless steel with a special tri-clad base (stainless steel sandwiching aluminium) that promotes fast and even heating of food and can be used on both electric and gas hobs. The Presto 01370 pressure cooker also contains a pressure regulator steam release valve (to automatically maintain the exact pressure needed to keep your food cooking at the optimum pressure and time without impairing flavour or texture), overpressure plug (to lower the pressure), an inner sealing ring (to maintain an airtight environment to enable a build-up of pressure), cover lock indicator allows you to instantly know if the pressure is too high inside the cooker at a single glance and prevents you from opening the cover until the pressure has been safely lessened. The Presto 01370 also comes with a stainless steel steaming basket with handles for cooking multiple foods at once (without crossing or diluting flavours) and a 64 page recipe/instruction booklet allowing you to maximise the functions of your Presto 01370 pressure cooker for great tasting dishes. And, just in case that wasn’t already enough in the first case, Presto give you an extended 12 year limited warranty, so that you can feel reassured that you will have your Presto 01370 around (and working perfectly under pressure) for a long time to come. Chicken, fish, meat, and vegetables cook to perfection in minutes. Quickly cooks and tenderizes economical cuts of meat. Stainless steel construction with a special tri-clad base for fast, uniform heating. Ideal for use on regular and smooth top ranges. 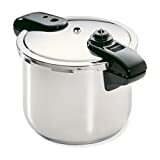 The Presto 01370 8-Quart Stainless Steel Pressure Cooker does exactly what’s advertised on the box. It’s given me, and my loved ones, excellent quality and healthy meals night after night, and the recipes allow me to try out even more meals that I keep finding I simply love. I adore the fact that it doesn’t take too long to prepare them and I can simply wash and chop my vegetables and meat, stick them into the cooker with my liquid and seasoning, lock it, turn on the gas and come back to completely cooked minestrone in all of 10 minutes. I’m besotted with the Presto 01370 and I have to commend whosever idea it was. It’s such a useful tool! I no longer have to worry about juggling priorities and responsibilities (between making dinner and writing up my analysis I didn’t have any free time, and I was left constantly shielding the computer from the danger of any wayward hot splashes of soup when the boiling got too vigorous). But the Presto 01370 allows me to relax, as I know that the overpressure plug, cover lock indicator and pressure regulator keep everything under control (and our family dinner securely under wraps). Even the simple things such as the stainless steel steaming basket means that I can simply put in my ingredients and not worry that the flavours are going to mix, affect one another, clash and throw off my whole ‘menu’ as it were. The Presto 01370 also allows me to know that (unlike microwaves and regular pots and pans) the heat is spread evenly throughout the dish, so that I don’t need to reheat the meal while praying that the already-cooked side doesn’t burn because the other side is stone cold. Put simply, the Presto 01370 watches my meals for me and ensures that every one of them comes out flawlessly time after time – and the durable, long-lasting steel ensures that these meals will continue to turn out the same way for a long time to come. Stainless Steel construction with Tri-clad Base, the aluminium allows my food to be ready quickly and ensures an even distribution of heat, while the fact that the steel touches the food ensures that there are no even remotely harmful toxins that get onto the food, especially because there’s no un-necessary non-stick coating. Pressure regulator, the element of the Presto 01370 that enables it to essentially cook for me after I’ve done some simple food prep and gone to get some work done or put my feet up for an extremely rare 5 minutes – well I can dream. Cover lock indicator, the automatic lock that prevents either myself, or another family member from opening the pressure cooker until we are absolutely certain that it’s safe to do so puts all of our minds at ease – although the pressure cooker rocks, the cover lock indicator still gives me and those around me a more sound state of mind. It’s less than $70, even with the stainless steel steaming basket and 64 page instruction manual and recipe book. When looking for a high-quality pressure cooker, I always look at certain features. The Presto 01370 seems to tick all of the boxes, and comes out excelling in terms of affordability. For that reason, I have to recommend it to my readers! Click here to see what other customers are saying about the Presto 01370.. Being fortunate enough to have purchased a Presto 01370 has been an eye-opening experience for me and it’s really made me rethink everything I thought I knew about pressure cooking, it’s nothing like the first generation pressure cookers (although it works in the same way) as the inbuilt safety features create a world of difference. With the Presto 01370, my meals are healthier; I have more time so that I can clean around the house and even get some extra work done. As a result I’m happier at work and feel even better about myself, thank-you Presto! 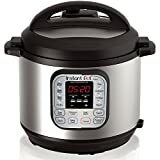 The Presto 01370 is an inexpensive pressure cooker that offers superior cooking quality in comparison to other models. A firm favorite with me and my household, and a definite must-have for mums and dads!